Home » News » Local News » Soccer City? 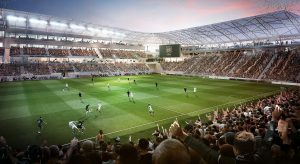 The Sacramento City Council voted 7-0 Tuesday night to approve an incentive package to help a local investment group build streets and other infrastructure around a privately financed $252 million soccer stadium in the downtown railyard. A decision on who will become the next major league Soccer city could come as early as next week. The league immediately responded to Sacramento after the vote congratulating Sacramento for approving such an incentive package.